We have a long tradition in the Parish, of working closely with our neighbours and friends from other Faith Communities, here in Southall and beyond…. 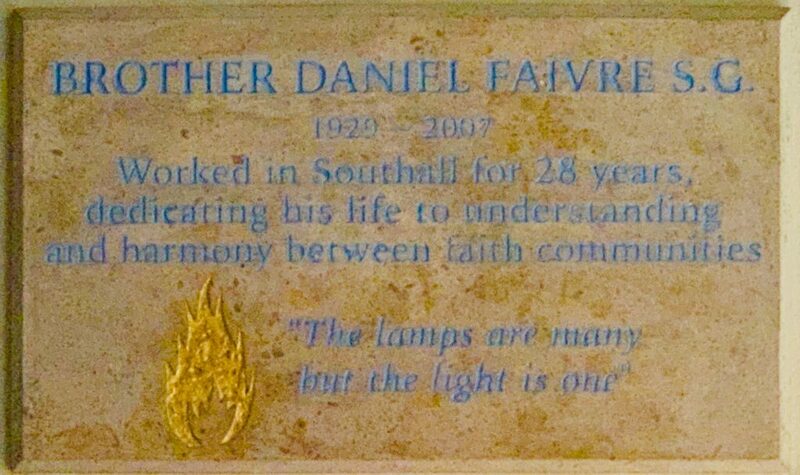 The good relationships that we enjoy today are due, in no small part, to the work of Brother Daniel Faivre S.G. who worked tirelessly in Southall for 28 years, fostering better understanding and collaboration between all the various communities which make up Southall, now in the 21st century. This short video shows highlights of his work. It was made to mark the dedication of the memorial plaque (pictured above) which is in the church.